Is Israel Using Gay Rights to Excuse Its Policy on Palestine? Next month is Lesbian, Gay, Bisexual and Transgender (LGBT) Pride month, an international season of parades, cultural festivals and street parties celebrating gay rights. But amid all the good cheer, tensions are rising over a controversial issue that is splintering LGBT communities. Around the world, major pride events are being used as battlegrounds to combat what some pro-Palestinian, progay activists are calling pink washing: Israel's promotion of its progressive gay-rights record as a way to cover up ongoing human-rights abuses in the West Bank and Gaza. 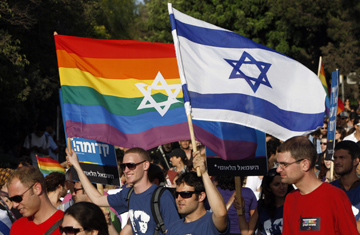 The accusations stem from efforts over the past half-decade by the Israeli government to weave the country's gay-friendly policies  including national hate-crime laws, employment protection for LGBT workers and openly gay military service  into its larger national-rebranding strategy, in the hopes of redirecting its global image away from politics, terrorism and the occupied territories. "The Israeli government and its propaganda organs ... insist on advertising and exaggerating its recent record on LGBT rights ... to fend off international condemnation of its violations of the rights of the Palestinian people," says Joseph Massad, associate professor of modern Arab politics and intellectual history at Columbia University in New York City. Nonsense, counters Ido Aharoni, Israeli consul general in New York City and former head of the Brand Israel project. "We are not trying to hide the conflict but broaden the conversation," he says. "We want to create a sense of relevance with other communities." Although its foundations lie in decades of political struggle, the pink-washing movement has recently kicked into high gear. In June 2010, gay-pride parade organizers in Madrid banned a contingent of Israeli marchers in response to the deadly Gaza flotilla raid weeks earlier. That same month, activists protested the Israeli government's co-sponsorship of San Francisco's Frameline LGBT Film Festival. In March this year, the pro-Palestinian group Palestina protested a conference in Stockholm featuring Israeli LGBT cultural figures. And at the Berlin gay-pride parade on June 25, the Israeli delegation will reportedly promote Tel Aviv  rather than the country as a whole  in an attempt to avoid provoking anti-Israel sentiment. On the other side of the issue, activists and the authorities who support Israel are pushing back against the antipink washers. In March, a planned Israeli Apartheid Week event at New York City's LGBT Community Center was canceled after loud opposition from local pro-Israel groups. And in Toronto, the Queers Against Israeli Apartheid has had to pull out of the July 3 pride parade after the mayor's office threatened to withhold funding for the parade. While it may seem unusual, the conflation of LGBT politics with the Middle Eastern politics is somewhat inevitable. Jews have traditionally been at the forefront of historic LGBT-rights battles, while the gay community has long played a prominent role in the antioccupation movement. But what is surprising about the pink-washing movement is the relatively muted response from Jews themselves. A few New York Jewish groups did protest February's planned Apartheid Week event. But most major Jewish advocacy organizations, like the Anti-Defamation League, have stayed silent. Much of that inaction is down to demographics: support for Israel is strongest among more-conservative American Jews who in general would neither be involved with the gay community nor publicly protest its anti-Israel activism. At the opposite extreme, progressive Jews typically back LGBT causes, but their progressiveness also extends to their opinions on Israel. As some of Israel's harshest critics, progressive Jews are inclined to back pro-Palestinian groups and often even form their core leadership. As a result, American Jews on every part of the ideological spectrum are unwilling to provide a counternarrative to the anti-pink-washing movement. "As part of a minority group themselves, there is great ambivalence [among American Jews] about combating anti-Semitism on the left  particularly when it comes from other minority groups," says Kenneth Marcus, head of the Anti-Semitism Initiative at the Institute for Jewish and Community Research in Washington, D.C. "The organized Jewish community is good at standing up against far-right hate groups, but has been far less successful in defending itself against nontraditional forms of anti-Semitism." Over in Israel, meanwhile, community leaders seem to view the debate as a problem for their country's image abroad that has little to do with LGBT issues at home. "Rather than openly opposing international anti-Israel LGBT groups, the gay community in Israel has essentially ignored the pink-washing issue," says filmmaker Yair Qedar, whose recent movie Gay Days is the definitive history of the Israeli LGBT civil rights movement. "This is a real shame because LGBT rights are something Israelis should be proud of  for ourselves, our neighbors and all peace-seeking people." By making Israel out to be a "pink leper," says Qedar, the anti-pink-washing movement "ultimately serves homophobia far more than dialogue and peace." As Qedar suggests, the real danger of both pink washing and the anti-Israel opposition is their potential to distract both camps from the long-term goal of peace. Each side fails to recognize core  and perhaps, constructive  truths about the other: Israel does have some of the world's most progressive LGBT policies, yet it's also mired in an illegal, militarized West Bank occupation. These two realities not only can but already do co-exist between the Jordan River and Mediterranean Sea. See the Top 10 Everything of 2010.